There are so many golf balls to choose from and it may seem like it is really difficult to choose a golf ball that will suit your golf game. If you like a golf ball that spins but don’t want it to spin too much off the tee, then consider the Taylormade Project Golf Balls. The Taylormade Project A Golf Ball is a golf ball with awesome feel and performance similar to the ball a professional would use. It is known as the Tour Ball designed for the Amateur, targeted at handicaps roughly around eight to eighteen. Here is a short and sweet Taylormade Project A Golf Balls Review, covering some of the golf balls main features. With a low compression core, this golf ball has been made softer to increase feel and spin on short approach shots around 30 yards from the green. It will suit average swing speeds that most mid to high handicap golfers would generally create. A revised formulation of the react core is what really helps drop the compression of the Project A golf ball. This is where Taylormade have really managed to differentiate with their competitors. 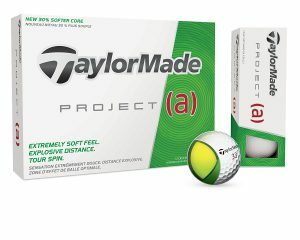 The Cover of the Taylormade Project A Golf Ball is the same cover that they use on all of their Tour Level Golf Balls. This means that the ball is easier to spin for most amateurs inside 30 yards. A Urethane Cover is basically a rubber cover that reacts really well with the grooves on golf irons and wedges to help create backspin. This is a three-piece golf ball with a mantle that has been specifically designed for more greenside spin. Most three-piece golf balls are generally designed for players who like to spin the ball around the greens and are reasonably good ball strikers. The Taylormade Project A combines with the low compression core and the spin mantle to create a tour-level golf ball for amateur golfers. The Taylormade Project A Golf Ball is available in traditional white targeted at most golfers. A bright high visibility yellow is also available for easy spotting in the rough and also for a better general visual. To represent the three-piece nature of this golf ball, balls are numbered as 00,11,22 and 33 which is completely different to the normal way golf balls are numbered. 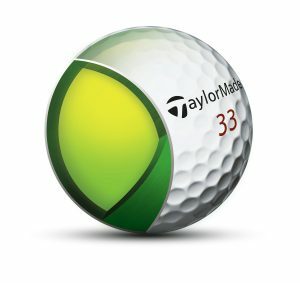 If you are the sort of golfer that is tired of using the two-piece golf balls that simply do not spin, then why not give the Taylormade Project A a try. The low compression core of the golf ball makes it a forgiving option designed for average to slightly faster swing speeds. The soft cast urethane cover is the part that makes this ball a big deal. With a bit of practice get those chip and pitch shots to bite on the green and even spin. Click the following link for information on how to choose golf balls. Hi! Wow!! I didn’t know that there could be different type of golf balls! I love the way you explain the features of the Taylormade project golf ball. Do you think that the type of ball could impact on your game so much? I’m not an expert but you gave me a clear review so that maybe I could consider the fact to try some swings. The Taylormade Project A Golf Ball is a fanstastic option for most amateur golfers. The Urethane Cover will provide the feel and spin needed to control shots around the greens. This is similar to the golf ball a lot of Touring professionals would use. I just started playing golf, so as you understand I have searched for everything related on the web. I’m so glad I stumbled upon your site, I loved the beginner’s guides. It’s so true that choosing golf balls among the endless choices is kind of a struggle, but your review helped me so much! I love that they Taylormade Project Golf Balls are for amateurs but professionals can use them too! The Taylormade Project A golf balls are definitely a popular option for amateur golfers right now. The feel around the greens is fantastic and they are very forgiving off the tee.